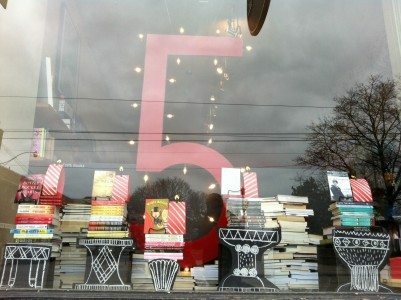 In celebration of its fifth anniversary, Type Books in Toronto (883 Queen St. W.) has put together a birthday-themed storefront. The window treatment is just part of the celebration, which culminates in a full-day, in-store party on April 30, and features books by 18 local authors who will perform at the event. Authors on the program include Andrew Pyper, Jessica Westhead, and Michael Redhill. The full line-up is listed in Type’s birthday flyer.